The first reference to the Mapothers (sometimes Maypowder) in Ireland is found in 1588 to Richard Mapother Sheriff, of Roscommon. This was during the reign of Queen Elizabeth 1. By the early 1600’s the Mapothers were granted land in Co. Roscommon and they established their main Residence here in Kilteevan. They intermarried with the Croftons, Nugents, Kellys, and Taylors of Swords, Co. Dublin. The family’s reputation has been heralded as that of a kindly landlord regime. Master Tom and his sisters Harriet and Mary were directly involved with the local community. They contributed financial support each year to the Kilteevan Catholic School. Samuel Lewis in “A Topographical Dictionary of Ireland”, 1837, states that Mrs. Mapother contributed £5 annually to one of the two private schools in the locality. The site for the first ‘formal’ school was given by John E. Mapother and the Mapothers were always trustees of the schools. They were also associated with the school in Cloonmore. The late Canon Kilmartin (a native of the parish) spoke of the “extraordinary kindness of the Mapothers to the people of Kilteevan when history demanded otherwise”. In addition to the latter, when a grave was being filled in the tradition at the time was to fill in to about 1 foot above ground level. Then it had to be ‘sodded’. The sods for the grave were always taken from another field. Thomas Mapother did not object to sods being taken from his land. About sixteen sods were needed and it was custom to cut three extra and these were left on the wall of the graveyard. (M.MS. 1506, p482-483) On St. Patricks Day the local children (often up to thirty) would go down to Kilteevan house after second mass. Miss Mary and Harriet would give each child a ‘badge’ – they would cut out a round piece of cardboard and criss cross it with different coloured ribbons (M.MS. 1506, p327). Harriet Mapother died in 1907. Thomas Austin Patrick Mapother (Master Tom) lived in Kilteevan House until his death in 1919. Kilteevan house and estate became the property of Dillon Edward Mapother who lived in Louisville, Kentucky, USA. At the request of Thomas, prior to his death, his sister Mary was allowed to live in Kilteevan house until her death in 1932 aged 96 years. Dillon Edward Mapother died in 1933, whereupon his wife sold the estate and Kilteevan house to the Irish Land Commission. The sale was a protracted matter and not completed until the late 1930‘s, leading to the house falling into disrepair. Locals recall attending dances in the ballroom of Kilteevan House when it was in the ownership of the Land Commission prior to its demolition. The estate was broken up and the lands sold in 1942. Professor Edward Dillon Mapother, who was born in 1835, was an eminent Dublin surgeon, dermatologist, and President of the Royal College of Surgeons. He died in London in 1908. His son Dr. Edward, a noted London psychiatrist, died in 1940. To this day some Mapothers still live in Dublin but it is the Mapothers of Kilteevan that will always be remembered for their generosity and commitment to their local community. Dillon Henry Mapother, born in the 1832 was the second son of Henry Mapother. He travelled to the United States in 1849. Dillon Henry had a professional qualification in engineering and by 1860 he had built a successful business and acquired property in Louisville, Kentucky. He married Mary Pauline Russell Cruise in 1858. They had six children before the death of Dillon Henry Mapother in 1874. In February 1876, Mary Pauline married Thomas O’Mara and they had one son Thomas, born in December 1876. As the Irish branch of the Mapother family had no issue, inheritance rights of the Roscommon estate was likely to revert to the American branch of the family. This may explain why Thomas O Mara changed his name to Thomas Mapother Cruise 1 though evidence is incomplete. In 1907, Thomas (aged 35) married Anna Stewart Bateman. The couple had two boys, Paul and Thomas Cruise Mapother II, who was born in 1908. Thomas Cruise Mapother II grew up to marry Catherine and became a highly respected lawyer in Louisville, establishing the family firm Mapother & Mapother on Jefferson Avenue. In 1934 their son, Thomas Cruise Mapother III was born – the father to Hollywood actor Tom Cruise. He attended the University of Kentucky where he excelled at his engineering studies. When he graduated he joined General Electric as an engineer, working for his father-in-law. Thomas and his wife, Mary Lee had three children, Lee Anne, Marian and on July 3rd, 1962 their son Thomas Cruise Mapother IV was born. The family moved some seven times in the first eleven years of Tom Cruise’s young life. This took its toll on his parents who eventually divorced. Thomas Cruise Mapother III died of cancer in 1984. Tom Cruise Mapother IV, or Tom Cruise born in Louisville, KY in 1962 is a descendant of this line of Mapothers. A well know Hollywood star, Tom Cruise has featured in a long line of successful Hollywood films including A Few Good Men, Mission Impossible, The Fourth of July, Rainman, and many others. Dillon Henry Mapother’s son Dillon Edward, who was born in Louisville in 1862 inherited the Mapother estate on the death of Thomas Mapother Kilteevan in 1919. Prior to his death Thomas has requested that his sister Mary be allowed to remain in Kilteevan House until her death. Mary died in 1932. In 1933, Dillon Edward Maypother died and his wife inherited Kilteevan House and estate. The estate was sold to the Irish Land Commission by Dillion Edward’s family following protracted efforts to successfully establish their rights of inheritance to the property The Land Commission subsequently demolished Kilteevan House and divided the estate. Irish Lives remembered Genealogy Magazine Issue 11, April 2013, “Enclann proves it’s not a Mission Impossible to trace Tom Cruise’s Irish Ancestors” by Fiona Fitzsimons & Helen Moss. Ryan, H. A. (1997), Kilteevan: a look at a School and its Parish: Kilteevan. Kilteevan School Board of Management. Mapother Family Tree from The Kilteevan Report, Kilteevan Community Development Group, 2003. The folklore and history of the parish was collected through Kilteevan and Shannon View schools in the mid to late 1930s, much of it in 1938. The material in manuscript form is now part of the Schools’ Manuscript Collection (Vol. 260) in the Department of Irish Folklore, University College Dublin. There is also a copy of this material on microfilm in the County Library, Roscommon. Material was also collected by Miss Noreen Higgins on the south of the parish and forms part of the Main Manuscript Collection (Vol. 1270). Several aspects of the history and folklore of the parish were covered in this collection. Recorded here, encompassing the above collections, are some brief glimpses of the past of Kilteevan parish. Our tour of the sites begins in the east of the parish and moves from townland to townland in alphabetical order. References to 1837, unless otherwise specified, refer to The Ordnance Survey Name, Books, Roscommon 3, Kilnamanagh to Roscommon, 1836-37 by John O’Donovan. Contained a lime kiln and corn kiln in 1837. 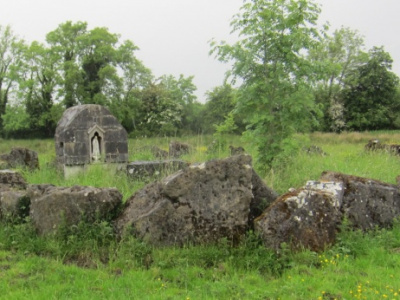 One of the oldest known foundations in the parish is locally known as St. Ronan’s Oratory (or Kilronan, the church of Ronan) and is situated in this townland. The siteis not recorded in any official documentation or on any maps. A cross inscribed slab which is now in the National Museum was found here. It “is of sandstone and measures 52 by 48cm and is 15cm in maximum thickness. It is decorated with an outlined ringed Latin cross, the arms of which are slightly expanded. Above the cross there are very poorly defined traces of an inscription on a slightly raised rectangular band. Some of the letters are indistinct but it might possibly be interpreted as a name such as CROBRAN 1” whose personage cannot be identified. Some low stoney banks can be traced which are probably the foundations of a stone built rectangular structure which is now collapsed. These are “situated in the centre of a roughly circular area some 60m in diameter, which is delimited by the very faint traces of a low earthern bank. The area enclosed slopes very gradually upwards and outwards so that the church site is located more or less in the centre of a shallow, saucer like depression. This could be interpreted as the enclosure which surrounded and delimited the majority of early monastic sites” 2. Fr. Finan gives the following description of the site. “Kilronan on the interior measures 17ft 3ins long by 10ft wide. The walls are about 3ft thick. The building was done in a very primitive style. Flags were laid on the loose earth. These were the full width of the walls. On this foundation the super structure was raised. Mortarwas, however, used in the building. The door was on the west end”. In January 1912 Fr. Finan had the foundations dug up. During this operation human bones and teeth were discovered both among the stones and beneath the floor. Years previously when the land nearby was being drained a number of bones were also discovered. Itis thought that some of these may have been deposited among the stones of the church.Local tradition states that a graveyard surrounded the church. Some people claim that it was used as a burial ground for infants (cillín). Two wells are marked on the Ordnance Survey map - one St. Bridget’s well, which was used until recently as a domestic water supply. It is located on the left hand side of the road travelling towards Kilteevan. The other well situated on the right handside of the road is marked ‘Tobernagreaghta’ - translated as the ‘well of the wounds’. It was originally marked by an ash tree and a white thorn bush. (S.MS. 260, p3). Tradition has it that it was originally situated in the townland of Aghmagree but ‘moved’ because it was desecrated by a ‘gentleman’ called Robert Ormsby. The well had the tradition of curative power for wounds and sores. Folklore records that Ormsby came upon a woman bathing a child in the waters who had scurvy. When asked what she was doing she told him of the blessed well and its cures. He then plunged his dog who had mange in to it mocking the faith of the woman and the tradition of the well. Another version of the story claims that one of his favourite greyhounds had broken its leg while out hunting and he washed it in the well expecting that it would set the dog’s leg. When nothing happened he “bitterly cursed the Church of Rome for her superstitions”.3 Because of this act the well is supposed to have ‘moved’ and split into two parts. The Pattern day was held on 15 August and attended by several people. A station (or a ‘round’) was performed . A rosary was recited “while going around the well starting and finishing at the ash tree and going in a clockwise fashion. They drink the water and those who have any wounds or sores wash the part with the water. They then tie a string on the ash tree or whitethorn bush. They also take some of the water to their homes”. (S.MS. 260, p.3). The well seems to have been visited from the 15 August until the 8 September, traditionally after sunset and before sunrise. 3. O’Donovan, John. Ordnance Survey Letters 1837, Co. Roscommon Book 1. p.54-55. Contained a smithy in 1837. The Kelly family were associated with this trade in thegeneral locality. The Main Manuscript Collection (Vol.1506 p.516-517) states that, aswell as the smithy in Ballinaboy, there was one in Killeenboy, Derrane road andRoscommon town. All of them belonged to the same extended family of Kellys. The ruins of a mill with its decaying wheel can still be seen in this townland. In recent memory it was known as ‘O’Brien’s’ Mill’. Its last occupant was Emma O’Brien. Emma died in the 1970s and her brother, James, a few years earlier. The 1749 Census lists Lawrence Finneran as a miller who had 4 children over 14 years of age. The Tithe Applotment Books (1833) record the existence of a corn mill with James Finneran as occupier. In Griffiths Valuation (1857) a James Finneran had over 16 acres of land leased from John E. Mapother. It contained a house, offices, cornmill and tuck mill (for thickening frieze). The rateable annual valuation of the buildings was £8-0-0. The mill was bought by Pat O’Brien in the 1870s. It ceased to operate as a mill in the mid 1920s though the building remained the dwelling house of his son and daughter. The family are buried in Kilteevan Graveyard. The ceiling of the house was constructed of wicker panels supported on wooden poles,all resting on four strong beams set into the walls. It had eight panels, of equal size,which were coated with clay to give a hard floor above to walk on. This area wasused for storing potatoes and may also have been used for sleeping accommodation 4. Contained a limestone quarry and some crockery kilns in 1837. A platform ringfort isstill extant in this townland 5. 5. One of the most common sites in the parish is the ringfort, with several still extant. The ringfort is probablythe most widely distributed and the most numerous of any class of ancient monument in Ireland. It was adryland protected homestead where a farmer lived and where he may also have housed some of his domesticanimals. The ‘typical’ ring fort would have a circular open space surrounded by a bank and enclosing ditchcrossed by a causeway to an entrance gap. However there are many permutations on this ‘typical’ appearance.The most common variant is the ‘platform rath’, where the ditch spoil instead of forming an enclosing bank wasspread over the whole interior to create a low platform, one metre or less in height. This seems to be the typemost commonly found in Kilteevan parish. A smithy is recorded in 1837. The folklore collections record two ringforts extant in the townland in 1938. One was about 200 yards (183m) north of the river Hind in Treacy’s field, surrounded by a ring of hawthorn. The other fort is recorded one mile west of Shannon View school. It was adjacent to Mrs Clasby’s house with nut trees growing around it. (M.MS. 1270,p.48). A field in Clooncraff village is locally known as the Cealtra field. Legend claims that it was a stone circle which had been ‘taken over’ by an Anchorite (hermit). A cell survived down the centuries until in 1912 when Fr. Finan, the then curate of the parish, had a large group of local people dig it to pieces looking for artefacts. He found nothing but a skeleton. The farmer who owned the land then cleared away some of the stones so that all that sadly remain is a pile of stones under a thornbush. It was used as a cillín, a burial place for unbaptised infants, up until this century. An area associated with Clooncellan Abbey is called Crocán Cill Barra, a rounded hillock situated in the townland of Clooncraff. This was supposed to have been the burial ground for the monks of the Abbey and is about a mile from it. It is then thought to have been an island in the river. In the 1830s it was cleared of all stonesand markers by an inhabitant of Clooncraff village for use as tillage land. However one can still note the irregular depressions in the grass and can see where it was heavily ditched against the surrounding water 6. 6. Brennan, Donal. The Unforgetting Countryside. p.4-5. A lime kiln is recorded for 1837. Contained two pottery or crockery kilns in 1837. Both a limekiln and corn kiln are recorded for 1837. Several ring forts are extant. In the early 1960s the upper stone of a beehive quernwas found by the late Johnnie Dolan, Cloonmurly. The find was made while drainageworks were being carried out in the vicinity of a ringfort. Another quern was recovered in the general area in the late 1970s. It may be of disc (flat) type or possibly the lower stone of a beehive quern. In contrast with the beehive quern which was in use up until c. 500 A.D. the disc quern seems to have remained functional almost to the present day 7. Querns were used for grinding cereals. 7. Caulfield, Seamus. ‘The Beehive Quern in Ireland’, Journal of the Royal Society of Antiquariesof Ireland 1972. Vol.107. p.104. For many years a pile of small stones marked the spot where Johnny Irwin was shot. It was located on the roadside between Davis’ house and Nanny Brennans. It was the custom for many years after his death that anyone who passed by would throw a stone on to the cairn. This custom died out at the end of the nineteenth century (S.MS. 260,p.9). 8. Mulligan, Bill. ‘Tragedy in Cloontymullen’ Roscommon Association Yearbook (1986). p.43.Fitzmaurice. M. ‘Tragedy in Cloontymullen - Editor’s Note’ Roscommon Association Yearbook (1987).p.39. The ivy mantled ruin of Cloonsellan Abbey possibly dates to the thirteenth century. It is thought it was a halfway house between the Abbey in Roscommon and Inchcleraun (Quaker Island). It is uncertain which of the Roscommon Abbeys it was associated with. Felim O’Connor, King of Connaught and the son of Cathal Croovedearg (Cathalof the Red Hand), founded the Dominican Abbey in Roscommon in 1253. He had a residence in Cloonsellan as the Annals of Lough Cé mention that his ‘fortress’ there was burned in 1261. It is thought that he may have built the church in Cloonsellan asa country residence for the Dominicans. As such it would have been the daughterhouse of the Dominican Abbey in Roscommon. The ‘Beannacht’ river was a name attributed to the Hind. It is translated as the ‘River of the Blessing’. Tradition claims that every evening the monks from Roscommon and those from the Quaker (or Cloonsellan?) met on the banks of this river. The prayerful salutation by which they greeted each other when they met and parted is supposed to have given a blessing to the river (S.MS. 260, p.23). The main folklore ‘Tragedy in Cloontymullen - Editor’s Note’ Roscommon Association Yearbook (1987).p.39. collection documents “the bridge of the Beannachts”. Later in the same article the term “Banniens” is introduced. “The Banniens is a small bridge in Cloonsellan. At this bridge the monks of the Quaker Island and the monks of Cloonsellan Abbey used to part. When they were saying goodbye they used to say ‘beannacht leat’ and that is why it is called the Banniens” (M.MS. 1270, p.174-175). A tuck mill and corn mill, lime kilns, smithy and a pottery are all recorded for the year 1837. The older part of the local graveyard is surrounded by a circular or oval wall and contains the ruins of a church which probably dates to the thirteenth or fourteenth century. In the eastern gable is a beautiful ornate window which has been dated to the late fifteenth or early sixteenth century by H.G. Leask 9. Two other windows of simpler design also remain. During a clean up in recent years numerous worked and carved stones belonging to the church were found. Several fragments of quern stones were also recovered. With its enclosure, church ruin, the burial ground and adjacent townland/parish placename, Kilteevan, with its ecclesiastical derivation, a certain amount of archaeological evidence is provided for the founding of the site in the early Christian era. 9. Leask, H.G. Irish Churches and Monastic Buildings. Vol. 3 (Dundalk 1985). p.130-31. The demesne and pleasure grounds of Kilteevan House are located in this townland.It was the home of the Mapother family for several generations. The Mass rock, which was used during Penal times is situated in an area marked ‘Curraghduv’ on the Ordnance Survey map. Mass was celebrated here in August 1989. Six priests concelebrated the mass and a large crowd attended. It was the first mass to be said here since the Penal Days. The mass rock is located within a conjoined ringfort. One section of the ringfort is of platform type construction and the other section has an earthern bank, now defaced in places, and a ditch. This area was locally known as the ‘crow’s wood’. A large ringfort is recorded on the first edition Ordnance Survey map (1837) and byJohn O’Donovan (O.S. Name Books 1836-37). It was levelled some years agoaccording to a local farmer. 10. Lucas, A..T. (Director). ‘National Museum of Ireland Archaeological Acquisitions in the Year1960’, Journal of the Royal Society of Antiquaries of Ireland 1962, Vol. 92. Pt.2. p.150. Two large solid wooden three piece wheels were found in 1968 and 1969 by theMooney family during turf cutting operations in the same bog. The 1968 find was lefton the surface of the bog and only two warped fragments survived. The wheel foundin 1969 was reported to the National Museum Dublin (Reg no. 1969:715). It forms part of an exhibition entitled “Prehistoric Ireland” which explores the earliest evidence ofpeople in Ireland and is on display in the National Museum since 1994. The wheelswere found about 90m distant from where the sunflower pin was found. They gave radio carbon dates of c.450 and c.365 b.c. respectively 12 and seem to have been identical in size and construction. They are the only wheels which survive complete from that period and probably were part of a two wheeled vehicle. It is interesting to note the experts view point on the find. Peter Harbison suggests that they were used on a heavy agricultural vehicle 13. According to A.T. Lucas the quality of theworkmanship “may denote that the vehicle to which they belonged was a symbol ofsocial status or used for ceremonial purposes”14. 12. Harbison, Peter. Pre-Christian Ireland From the First Settlers to the Early Celts (London 1988). p.165. 14. Lucas, A.T. ‘Prehistoric Block Wheels from Doogarymore, Co. Roscommon and Timahoe East,Co. Kildare’, Journal of the Royal Society of Antiquaries of Ireland 1972 Vol. 102. p.31. Contained two public houses in 1837. A platform ringfort is still extant. It is in fact located half in Killeenboy and half in Creevyquin as the townland boundary bisects it. A stile on the roadside was known as ‘Carroll’s Stile’. “There are just a few stonesteps in the side of a ditch, leading up to the field, which is here 6 or 8 feet higher thanthe road. It is said that in the penal times a Priest was being closely pursued by some ‘priest hunters’ in the vicinity of this stile. All were on horseback. His pursuers were so close upon him when he came to this stile that his capture seemed certain. When the horse came to this stile he gave such a leap that he actually flew a great distance thus leaving his pursuers a long way behind. The horse in taking the leap left the clear imprint of his shoe on one of the flat stones on the top of the stile. The priest’s name was Father Carroll. This stone is supposed to have been extant in the early 1900s and thought to have been removed to the National Museum (S.MS. 260, p.10-11). A ‘gentleman’s’ seat called Grove and a demesne is recorded in 1837. A pottery kiln and several lime kilns are recorded in 1837. All that remains today of Beechwood House is the ice house which is a well preserved brick-lined underground vault and the ha-ha which surrounded part of the estate. This was a sunken wall which did not interrupt the view from within the pleasure ground sand was not seen until closely approached. Several names are associated with Beechwood house. D. H. Farrell left the estate to his nephew John Irwin (Oran). On his demise it then passed to his brother Daniel H. Irwin who died in 1866. Clarinda Irwin died in 1891. In the latter years of the estate the ‘Miss Nolans’, Clare M. and Kate Alice were the occupants. One of Daniel Irwins sisters was married to P. Nolanof Logboy, Co. Mayo so the ‘Miss Nolans’ may have been connected to the family through that marriage. Mr Glover was the last resident and seems to have been a caretaker appointed by the Ulster Bank, Castlerea who were handling the affairs of the estate. From the 1901 Census we get some picture of what the house was like. There were 18 windows in the front of the house and 19 rooms were occupied. 17 outhouses are listed, 6 of which were stables. The house contained a ballroom the full width of the house with a maple floor. The house was demolished in the 1940s. Some of the stones removed were used in upgrading the ‘lane’ in Beechwood (laneway which leadstowards Carrowbaun townland). Also some cut stones were used to line the well on the edge of this laneway. The timbers were removed by McMahons of Limerick. Tonlegee (R.I.C. Barracks). The building, known as the Barracks, is now a private dwelling. It served as the R.I.C. Barracks for several years. According to the Cancelled Books of Griffiths Valuation it was built in 1863. When in operation as a barracks there were two separate sections in the building - one was the residence of the Sergeant and the other for the use of the remaining officers. In the 1901 Census one sergeant and five constables are recorded. It is supposed to have been burned on Easter Sunday 1919 bya local IRA column. In the Baptismal Register of Kilteevan a son was born to William Lambert who was stationed in the Barracks in 1915. The baptism of another child is recorded for January 1922 so presumably the Barracks remained occupied until the disbandment of the R.I.C. in 1922. A late medieval cross is situated on the road from Beechwood cross to Kilteevan. It is of limestone and bears the inscription ... / RORIE: / HANLY / 30 : IVLY / 1632: and MARY BOORK / BRYAN KERILY / MAZO(N) on the opposite face. It is locally known as the Market Cross as in olden times a market was held here. “It is also said that any person who was found guilty of any offence was marched up and down while the market was in progress with a placard on their back and breast stating the offence they were found guilty of ” (S.MS. 260, p.8). It is thought by some people that it was set up as a boundary of O’Hanly’s country 15. 15. Sharkey, Rev. P.A.. The Heart of Ireland (Boyle 1927). p.340. NOTE The majority of the sites are on private property. Please obtain permission from the landowner before accessing a site. To overcome obstacles to the celebration of mass, the practice was driven into remote areas where people gathered to celebrate mass in secret. Because the activity was illegal, the services were not scheduled and their occurrence was communicated verbally between parishioners. Mass was celebrated on a rock or earthfast boulder used as an altar. The Kilteevan Mass Rock is an example of such a location. People would congregate at the Mass Rock in Cloontogher townland. It consisted of a rock and a flat stone to form a table which was used as an altar to celebrate mass. In the nineteen century the table stone was over turned and broken by vandals in the belief that gold was hidden beneath it. This area is marked Curraghduv on OS maps and translates as “black rock”. This mass rock is located within a conjoined ringfort. In 1913, Rev. Finan, a local priest noted, how the Mapother of the day found his wife, a secret catholic, worshipping at the Mass Rock. After his discovery he apparently informed his wife that she no longer needed to secretly leave their home at night to pray but could attend Mass as often as she wished. In the 1980’s the Gillooly family, Kilteevan marked the Mass Rock site by erecting a circle of standing stones, a grotto containing a statue, and a plaque which reads, “In Loving Memory of All that Prayed at this Mass Rock in Penal Days. They were true to God and Ireland. Erected by the Gillooly Family.” A stone holy water font was also relocated here from the former Catholic Church. In 1983, John Gillooly the owner of the field containing the Mass Rock told Br M.F. O’Conchuir, (CBS, Roscommon) that when purchasing the land from the Mapothers, his family had to sign a declaration, guaranteeing that the Mass Rock would never be removed from it’s original site (2). Mass was last concelebrated here in 1989 with a large crowd in attendance. Mass Rock is situated on Private Property which you should not enter without prior permission. 1. Foster R. E. (1988) Modern Ireland 1600-1972. London: The Penguin Press. 2 O’ Conchuir M.F. (1983) The Kilteevan Tradition. Roscommon Association Year Book. The Gate Lodge was the only one on the estate and guarded the main tree-lined avenue to Kilteevan House which was owned by the Mapother family. Today the building has no internal divisions but originally contained a kitchen and bedroom with a loft over the bedroom. The rooms were divided by a stone chimney breast, which was removed in recent times. The piers leading into the house at the gate lodge entrance were relocated close by. It is believed locally that the avenue was lined by magnificent Californian Redwoods, which were later felled, cut and sawn up locally for use a fence posts. Tradition claims that Kilteevan House, constructed on the site of an earlier 17th century Mapother residence, was begun in 1710, partially finished in 1711 and completed in 1713. A carved stone, bearing the date 1711 (now missing) lay for years in the undergrowth adjacent to the house ruin. It is supposed to have come from the coach house. The house was a substantial three bay-two storey over basement building with a classical Grecian–style portico over the main entrance. The 1901 Census states that 17 rooms in the house were occupied. 15 farm buildings were also listed; 4 stables, 2 sheds, coach house, harness room, cow house, calf house, dairy, fowl house, barn, turf house and potato house. Only the ruins of the basement, several outbuildings, and stables have survived. There was also a fine orchard on the estate. Some locals recall the adventure of scaling the wall to get into the orchard and helping themselves to the Mapothers’ fruit. A layout of the demesne can be seen in the O.S. map of 1914 which shows the buildings, gardens with pathways and a pheasantry. The last of the family, called ‘Miss Mary’, died in 1932 and the Estate was divided by the Land Commission in 1942. The Gate Lodge is on private property, and this sign is placed here with the kind permission of Mattie and Gertie Murphy. The medieval church ruin at Cloontogher has been dated to the 12th or 13th century but the site itself was probably an earlier Christian foundation. The church has been associated in local memory with St Bridget and St Kevin. The name Cloontogher can translate as the meadow of the togher or causeway. This is most likely the translation for this locality as evidence of a togher has been found in a nearby townland. The church, aligned roughly east-west, measures 6.35m by 11.60 internally. The northern wall and the eastern gable are well intact but much of the southern and western walls are missing. Three windows remain, with the eastern window being the most elaborate. The carved east window was described by Leask (1943) as “interesting and beautiful and a good example of the ingenuity of late 15th or early 16th century Irish mason-craft”. During the clean-up of the site in 1989 many dressed and carved stones from the church were found.Window heads, sills, jamb stones, mouldings and lintels were recovered. A simple stone cross, the shaft of which is broken was also found. Its type is difficult to date, but it may be as early as the 10th century. A number of graves are marked with field stones which bear no inscription or carving. A few graves are also marked with holed stones. These are probably naturally occurring but could hint at a pre-Christian origin. There are however, no rituals or traditions associated with the stones at this site. The area surrounding the church, which is enclosed by a roughly circular wall, has been used for continuous burial down through the years. The Mapother burial crypt is attached to the eastern end of the church. The oldest decipherable inscription of 1711 is on the wall memorial to the Mapother family in the church interior. The oldest one within the graveyard itself is 1718 (Coner). The adjoining section of graveyard was opened in 1950. The grave of an Irish US Army veteran, Patrick A. Garvey, can be found here. Donal Brennan, from Clooncraff, (Kilteevan), former Manager of Aer Lingus in Europe, is also interred here. Four Mapother memorials, a table tomb, an altar tomb, a recumbent marble memorial and a wall memorial are located in the interior of the church within the area enclosed by railings. There is also a headstone to the family at the eastern end of the crypt. The burial crypt measures approximately 3.8m by 3.9m with the side walls an average height of 1.6m approximately. The eastern gable wall is difficult to measure due to ivy growth but is in the region of 2.1m high. In general the structure is in a ruinous state as vegetation roots have penetrated its fabric and the ivy has obscured much of its features. It was brick-lined with an outer wall of limestone. A section of wall at the eastern gable was replaced in concrete by local council workers, probably in the 1960s, as the crypt had been vandalised. Local lore claims that the coffins within the crypt were lead-lined and the lead was being stolen for resale. In the 1990s the local graveyard committee carried out some emergency repair work to the northern side of the crypt as a section of the wall had fallen and the inner brickwork was exposed. The wall was rebuilt in dry stone but this has recently collapsed leaving a large section of brickwork uncovered. The building at the heart of the parish at its central crossroads has played a prominent role in the life of the parish since the early nineteenth century. It has had many uses since its construction. Firstly as a place of worship, then as a business premises and in more recent years Kilteevan Community Centre. Following an extensive restoration project the Centre was officially opened by President of Ireland, Mary McAleese on 4th February 2011.Within this building is the magnificent ceiling, hand painted by the Brentini brothers in 1904. Tradition claims that the first church on this site was a thatched church, built under the patronage of the Mapother family, which was used during the week as a school room. Two holy water fonts bearing the date 1782 may have belonged to this early church. Also a worked limestone slab with an incised cross and the date 1793 was recovered during the recent refurbishment works. According to Fr Finan (the first resident curate) the building as we know it today was constructed in two phases. The older part of the church (northern end facing the grotto) was built about 1819 by Dr McDermott, Adm. Roscommon almost on the site of the old thatched church and was also used as a school room. The nave, the central part of the church where the decorated ceiling is, was built about 1842.
until 1963. It was with much sadness that the people of Kilteevan received the news that the church had been condemned by the Diocesan Architect Mr B. Rhatigan, Sligo. The decision was to replace it with a new church, St. Joseph’s Church was blessed and dedicated on Sunday 25th August 1963. The last baptism was celebrated in the old church on 24th August 1963 by Rev Thomas Kilroy. The church was T-shaped in plan with the sacristy (a later extension) and two doors to the north and the main entrance porch to the south. The church bell was housed in the bellcote on the southern gable which is flanked by stone pinnacles. The walls were roughcast-rendered with limestone quoins. The pointed-arched windows also have limestone surrounds and once held beautiful stained glass. The door openings are also pointed arched with limestone surrounds. The door and window openings in the northern elevation have hood mouldings.